Tim Staley our Recycling Industry Sales Representative has spent in excess of 30 years in this industry and has been very successful in developing customer relationships in the United States. Currently we serve over 100 customers throughout 16 states in the United States. This industry is very destructive with hydraulic components and normally when they arrive at our location to be repaired they are in very bad shape. The components are used to bale, shear and shred scrap metal. After this process is finished it is ready to be shipped to a melt shop. A mixture of all 3 commodities is mixed to a specific chemistry to meet the steel mills requirement for their finished product. This stationery equipment ranges in size from small to extremely large and utilizes from 500 to 6000 gallons of hydraulic oil in their system. These machines operate in excess of 2,400 to 3,500 PSI. These machines generate extreme heat in their hydraulic system better known as heat load. Most stationary equipment manufactures recommend the hydraulic system operate at or about 100 to 130 degrees Fahrenheit. For this reason Tim has designed heat exchangers that Complete Hydraulic Service sells to keep the oil temperature operating at a consistent temperature. The cylinders range in size from very small to as large as 50 feet long, 5 feet in diameter and weighing 70,000 pounds. With our state of the art facility we are able to handle these large components easily and efficiently with our large over head cranes. We have large lathe capacities to add to our full machine shop capabilities. With these machining capabilities our customers feel comfortable we can handle their repairs efficiently and timely. Also this is contributing to our customer base continuing to grow. A typical repair of these large components consists, of disassembly with our current specialized tooling and we continue buying and upgrading the large tooling to keep this process efficient. 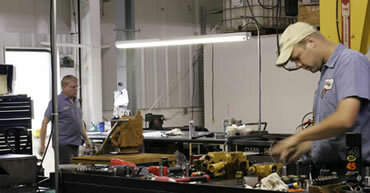 Once the component is disassembled they go through our normal rigorous inspection process as all other cylinders. The normal inspection usually reveals scores inside the tube that are very deep and must be repaired. The repair process involves honing the tube until all scores are completely removed. This is a very delicate operation to assure not to compromise the integrity of the tube yet assure a finish inside that will allow for proper sealing and not allow internal leakage. Complete Hydraulic Service has 3 options to properly find and fit packing for the rod and piston to maintain and stay within the OEM specification. Option #1 is to find and purchase the proper size direct from the manufacturer. Option #2 in some cases this packing is not available and must be manufactured to OEM specification to properly fit. Option #3 Complete Hydraulic Service also has the ability to buy OEM packing in the rough state and with our large lathe we have the ability to machine the packing to the tolerances of the OEM specifications. The packing must be machined and maintained to within a few thousands fit to allow proper sealing once the cylinder is reassembled. The cylinders are then tested for internal and external leakage before shipping to the customer.